While having appropriate labeling and naming for schematic symbols is the most critical aspect of organizing your symbol library, ensuring that pins for all symbols are consistent is equally critical. 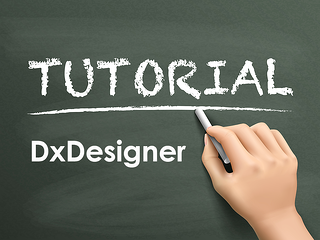 This maintains visual consistency on the schematic, and consistent connection points within DxDesigner. All of the pin settings must be considered: visual aspects such as length and orientation, as well as technical considerations such as inverted pins and location of connection points. Optimum maintains rigorous standards for pins on schematic symbols, let's take a more in depth look. Pin names should all be unique, duplicate pin names are not allowed because pins cannot be mapped in the layout tool if there are two pins with the same name. Even if pins perform the same function (ground connection, no-connects, etc), the names must still be unique. These pins are differentiated with a number at the end of the pin name; GND1, GND2, and so on. Pin Names will not always be shown, depending on the type of symbol. Generally speaking, pin names are not shown on discrete, connector, or logic gate symbols. They are shown on IC symbols. Pin Numbers will also not always be shown, depending on the symbol. In general, pin numbers are not shown on discreet symbols, whereas they are shown on connector and IC symbols. Pin Types are always invisible. Pin types used are IN, OUT, BI, TRI, and ANALOG. Pin connection points are determined by where the pin meets the symbol outline border. This outline appears as a white box surrounding the symbol during symbol editing. Pins can be of any length, and rotated to any orientation, but the connection point remains where the pin makes contact with the symbol outline border. There are four pin shapes utilized in symbols in Optimum’s library. Normal and inverted pins consist of the pin only, with no drawn graphics used. Clock pins are normal pins, with a clock graphic. Dot pins are created with the use of the “invert pin” option in DxDesigner. Normal: Active high input or output. Dot: Active low input or output. Clock: Active high clock input or output. Dot Clock: Active low clock input or output. Negative logic pins are displayed with the use of overbars in the pin name. The overbar is created automatically by checking the Inverted check box in the pin properties dialog. Selecting Invert Pin from the same dialog will give the pin a dot pin. The size of the dot is determined by the user in the schematic Setup > Settings > Advanced section. Optimum recommends a 0.010 dot for inverted pins. All power, ground, and no-connect pins are explicitly shown on symbols. No implicit pins are utilized for these functions.